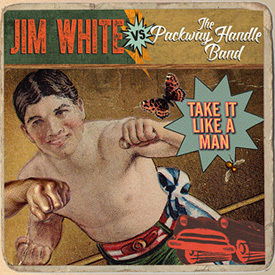 Bluegrass wouldn’t be the first thing you’d expect from Jim White; but after ‘discovering’ the songwriter after seeing his amazing BBC TV documentary; Searching For The Wrong Eyed Jesus, the Packway Handle sought him out to produce an album; only to discover he had a secret stash of Bluegrass albums dating back to his teens; and subsequently this album has developed. As White’s many fans will expect; this isn’t straightforward Traditional Bluegrass; but the end result is a joyous collision of styles that adds a bit of ‘edge’ and some pretty cool melodies to this straight-laced music. The banjo that opens the album on Smack Dab in a Big Tornado only lulls you into a false sense of security because the lyrics are quite Southern Gothic over a frantic hillbilly tune. I was hooked like a fish on a line. Jim 3:16 certainly isn’t your typical Bluegrass Religious Revival song; with a chorus of “A bar is just a Church were they serve beer” as a trumpet and possibly euphonium take the place of a Salvation Army Band as White ends up giving in to temptation and stays in the bar. Paranormal Girlfriend is probably the nearest thing to a Classic Bluegrass song; but even then there is a still a smile or two deep in the lyrics. While the rest of the album is a joyful riot, Sorrows Shine played out on banjo and gorgeous harmonies reminded me of GP by Gram; were a Rock singer is paying his dues to the music he grew up with and it’s a beauty. The only co-write here, Corn Pone Refugee is a veritable 100mph hoedown with the banjo and guitars being played at a fair old lick as Jim and the Handle Boys have the time of their lives. The album closes with a Gospellish song; Sinner! And it’s a peach – everything you would want and hope for from this delightful combination. While TAKE IT LIKE A MAN sounds nothing like the album Steve Earle made with Del McCoury in 1999, but the idea and the end result is just as intriguing and enjoyable.